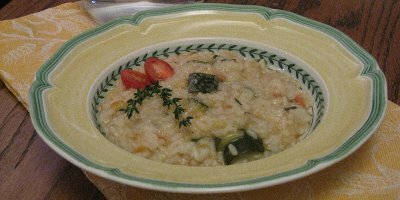 Risotto svuota-frigo, or if you like “all-I-have-left-in-the-fridge risotto”. This is not a “proper” recipe for risotto, but my way to use up those little bits left in the fridge from previous recipes. It is a way to prepare a satisfying dish for dinner with whatever I have, when I had not planned something in advance. Here is the version I prepared this evening. In a deep pot put some extra-virgin olive oil, the leek, and the shallot and let soften a bit on medium heat. Then add the zucchini, the tomato and the thyme. Season with salt and let cook a couple of minutes. Add the wine and let it evaporate. Last add the rice and let it warm up stirring for a few seconds. If, like me tonight, you are using a pressure cooker, add the water, season with salt and close the lid. Cook for 6 minutes from the time it begins to whistle. I hope there are no risotto-purists reading this post, otherwise please forgive me! It is a svuota-frigo recipe after all! (If you want to do it the proper way, add, a bit at a time, some vegetable broth that you have made in advance. The broth should be kept warm, in a separate pot, on a low heat. Keep stirring the risotto and adding the vegetable broth until the rice is cooked, about 20 minutes). When the risotto is ready, add some ground pepper and the parmigiano. Stir well and serve it right away. This looks amazing. I think I will make it Sunday. Thank you for the wonderful recipes.